Moon is our next door neighbor in space. Moon looks very prominent in it though hundreds of stars are visible in the night sky. Moon is the only natural satellite of the Earth. That means it is the only heavenly body circling the Earth. But, as you know very well, thousands of man made objects called artificial satellites are circling the Earth today. They include satellites built by Indian space scientists. The surface area of the moon is 14,658,000 square miles or 9.4 billion acres. The moon rotates at 10 miles per hour compared to the earth's rotation of 1000 miles per hour. The moon is about 1/4 the size of the Earth. Moon takes 27.3 days to circle the Earth once. And, it takes 27.3 days to spin around its own axis once. The moon does not produce any light; it merely reflects light from the sun. Also, the moon can be seen both during the day and night. Only 59% of the moon's surface is visible from earth. Thus, one hemisphere of the Moon is always turned towards us and we on Earth are unable see the other hemisphere of our Moon, which is referred to as 'the far side of the Moon'. Because, thing to notice is that exactly one half of the moon is always illuminated by the sun. However, since the rotational period is exactly the same as the orbital period, the same portion of the Moon's sphere is always facing the Earth. Also, looking at the diagram, at a new moon, the moon doesn't block the sun, and at a full moon, why the earth doesn't block sunlight from reaching the moon. 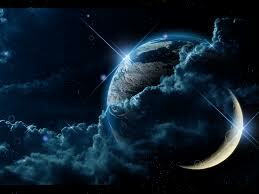 The reason is because the moon's orbit about the earth is about 5 degrees off from the earth-sun orbital plane. 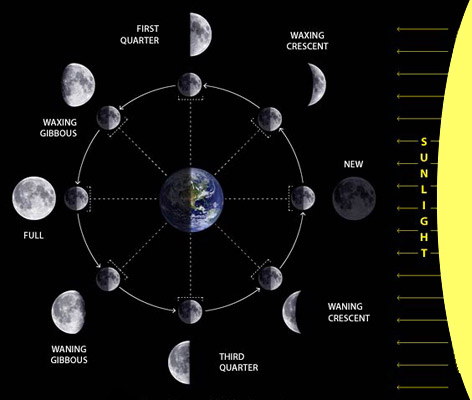 In this diagram, the new moon occurs when the moon is positioned between the earth and sun. The three objects are in approximate alignment. The entire illuminated portion of the moon is on the back side of the moon, the half that we cannot see. At a full moon , the earth, moon, and sun are in approximate alignment, just as the new moon, but the moon is on the opposite side of the earth, so the entire sunlit part of the moon is facing us. The shadowed portion is entirely hidden from view. The first quarter and third quarter moons (both often called a - half moon), happen when the moon is at a 90 degree angle with respect to the earth and sun. So we are seeing exactly half of the moon illuminated and half in shadow. However, at special times during the year, the earth, moon, and sun do in fact line up. When the moon blocks the sun or a part of it, it's called a solar eclipse , and it can only happen during the new moon phase. When the earth casts a shadow on the moon, it's called a lunar eclipse , and can only happen during the full moon phase. Roughly 4 to 7 eclipses happen in any given year, but most of them minor or partial eclipses. Major lunar or solar eclipses are relatively uncommon. The dark spots we see on the moon that create the image of the man in the moon are actually craters filled with basalt, which is a very dense material. The moon has no global magnetic field. Humans had their first glimpse of the far side of the Moon in October 1959 when an unmanned spacecraft called Luna 3 photographed the far side of the Moon from space and transmitted those pictures by radio to Earth. Later in 1968, three Apollo 8 astronauts were the first humans to directly observe the far side of the Moon.